toname wrote: You didn't understand what I wrote, apparently. A maxed HQ6 has a BS of 1338. A maxed HQ7 has a BS of 1688. All of our 7s are in that range. They don't have the "correct" BS because they are all developing 7s. You can't be a sandbagger if you are above the max BS for the level below you ! Where did you get 1575 anyways? That wasn't even an option. No one says that your team is made up of sandbaggers, what I told you is that the BS of your teammates is very low for their HQ levels. For that reason, I think that your team is there in that place. Once they upload his BS, it is most likely that your team access the next league. I have been reporting weekly stats for CWP since 2016 and the way I did it with KSOD was a very basic copy/paste values into a spreadsheet. The new GSOW's format is quite different, at least on the summaries as that's as far as I've got. When I copy the two columns and several rows of data and paste the values, all the data ends up in a single cell. I If do a straight paste, it shoots it backwards down a single column. Is there a way to transfer the data from GSOW into a spreadsheet that doesn't involve programmer knowledge? Because I have none. For now, no there is not. Sorry. I’m not sure that’s something that can be changed but it will be passed along. KSod was not very pretty but that simplicity did have some advantages for using the site beyond its initial purpose. For now the only workaround I can think of for you is copying one cell at a time so the lot does not get all jumbled. I do understand that’s far more tedious but it’s all I can think of for now. Btw, I think your signature gave me a seizure. Spock wrote: For now, no there is not. Sorry. I’m not sure that’s something that can be changed but it will be passed along. No worries! I figured it out. The members pages are fine for the way I do it and for the summaries If I just copy/paste the numbers column, which is the only one that changes anyway, I can get it to work just fine, so all good! Spock wrote: Btw, I think your signature gave me a seizure. Right on man. I’m glad you got it sorted. And ya, it is just a little. In the squad member page, in the left pane, along with the Avg. Base Strength (in current war), please also add Avg. Medal Count (in current war). I think it's due to the line up of the 15 players chosen for the war. The opponent, although it belongs to the UC league, lined up 2 players of level 9, 3 players of level 10 and the rest of level 11, while your team has 2 players of level 10 and the rest of level 11. This made the value of the BS this in favor of the imperial team and not in favor of your team. Should open a new topic to discuss about GSOW ranking formula and prediction. This is going to be a never ending story. - Your squad is ranked higher than Dark´FNX even though Dark´FNX is in UC, because the league grouping is simply based on base rating and not based on skill points. - A higher ranked squad will get no point or less skill points for beating a lower ranked squad. This makes sense. - The system predicted that your squad will beat Dark´FNX. This makes sense, based on the 2 squads' rankings. I actually think that your squad will win. 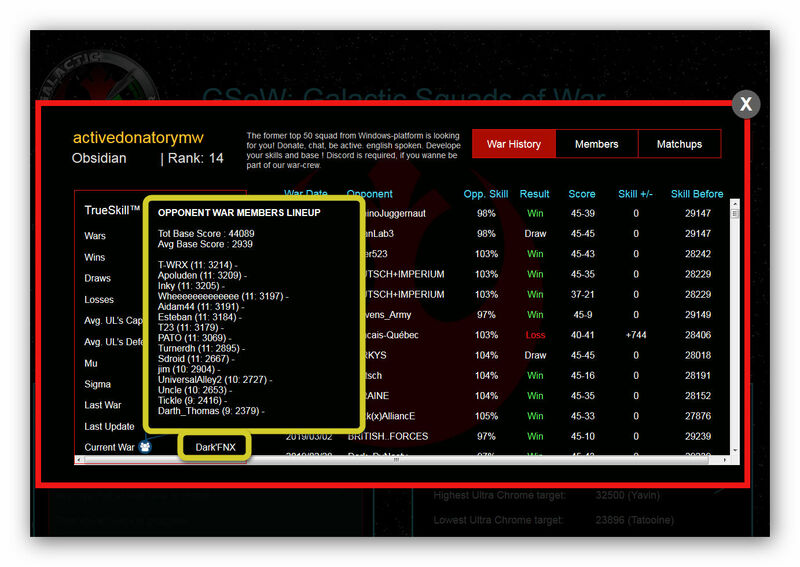 DarkRebel wrote: Should open a new topic to discuss about GSOW ranking formula and prediction. 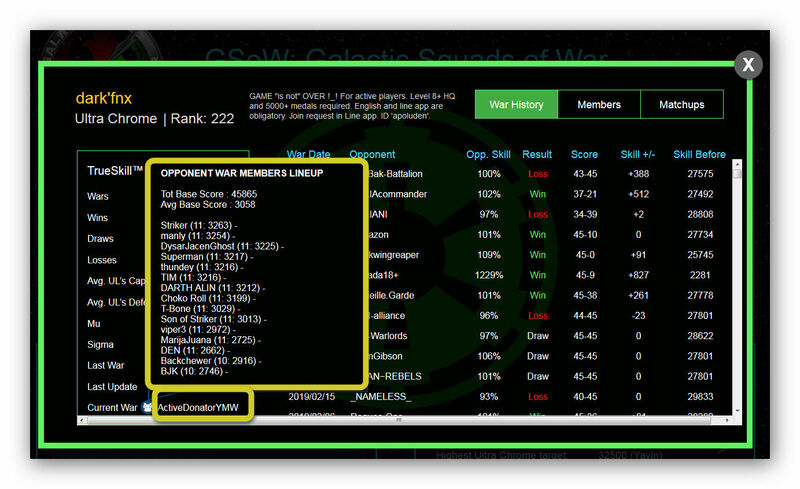 See New Related Topic: GSoW Squad Ranking - Discussion Topic. Passed it on to the team. I can’t promise anything though. League placement doesn’t mean a team is necessarily worse or better; the average UC “should” beat the average Ob, but skill is not always just based on size. Leagues are just a way of sorting the squads. It does not play a part in the predictions. The predictions work exactly the same way they did on KSod. Using MU and sigma. The wrench is that DarkFNX has a large sigma rating, which means there is a lot of uncertainty as to how good or bad the team might be against ADYMW.